Momma Told Me: I need my liquid energy. For better or worse, I was raised hooked on coffee. Momma liked hers black on 'Coupon Run Wednesdays,' since we'd leave the house before dawn to hit all 3 of the major grocery stores in our area. She didn't let me sip until I was about 7 or 8, but that's all it took to get me invested in (what was then, at my age) such an exotic treat. Today, I don't have the time or money to indulge my coffee cravings with long lines at expensive specialty coffee shops. And, let's face it, with temperatures in the mid-90s, I need my coffee ice cold. When I was younger Momma would make a second pot of coffee in the morning and place it in the fridge for later on in the afternoon, though she preferred iced tea to cold coffee- both took time and patience to make. Today I rely a lot on my Keurig to brew a pot for chilling, which is convenient for the most part but still requires me to keep a large portion of iced coffee in the fridge at all times. The coffee beverage lifestyle demands flexibility. If consumers are willing to pay $4+ a cup for their iced coffee on the go, shouldn't there be a more affordable way to enjoy a flavored coffee beverage on your own time? 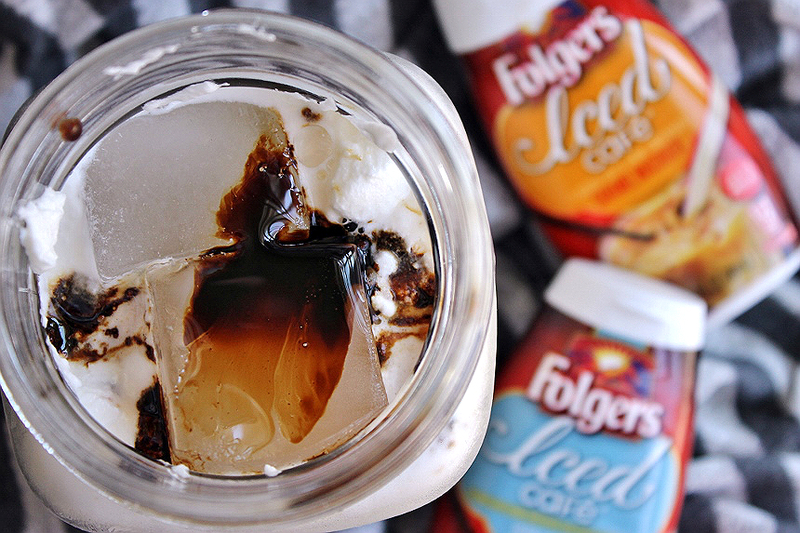 Introducing Folgers® Iced Cafe™ coffee drink concentrates. With a manufacturer's suggested retail price of just $4.99 (or the cost of a Venti Mocha Iced at that fancy coffee chain) one bottle of Folgers® Iced Cafe™ will yield 12 servings of 8oz Iced Cafe coffee flavored beverages while adding just 10 calories to your milk/milk substitute base of choice. Afraid you won't get your caffeine fix? 1 8oz (concentrate with milk/milk substitute) serving has a 72mg kick of caffeine. 8oz of straight coffee typically has 95mg of caffeine, so we'd call that a considerable kick for an iced beverage! 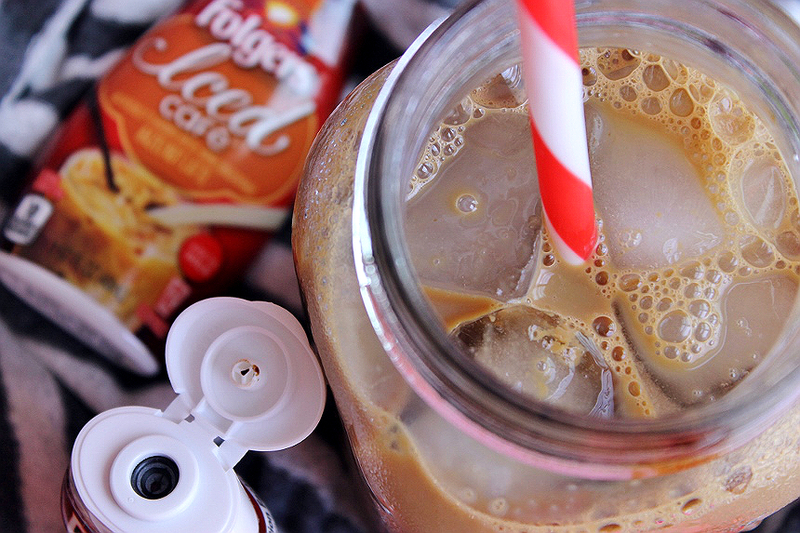 How convenient is it really to enjoy a fresh glass of Folgers® Iced Cafe™ any time? As long as you have access to your favorite Folgers® Iced Cafe™ flavor, ice, 8oz of your preferred milk/milk substitute and a straw, tumbler, or spoon, you're ready to begin sipping coffee inspired bliss. 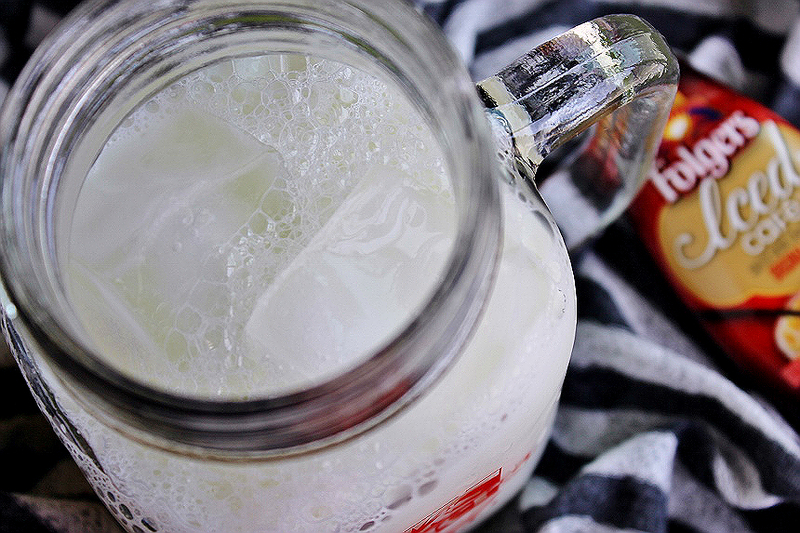 Simply add 2 squeezes of Folgers® Iced Cafe™ to your milk, or milk substitute of choice, add ice, and mix. The concentrate itself has a very strong and distinct coffee infused flavor with additional flavor notes depending on variety. Currently the range includes; Original Latte, Caramel Macchiato, Vanilla Latte, and Hazelut Latte. While Caramel Macchiato is my current favorite I'm hoping the brand will release a Mocha variation and possible a Pumpkin Spice flavor as we head into Fall! 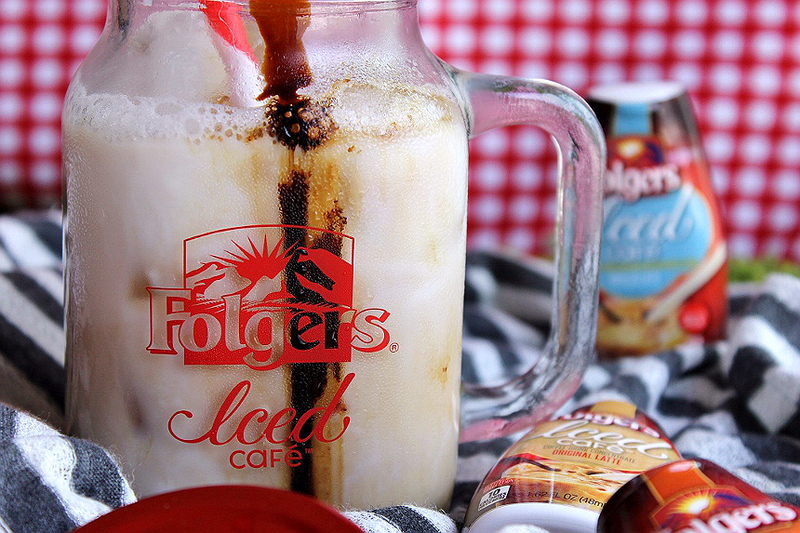 Folgers® Iced Cafe™ 1.72oz varieties at a grocery store, Walmart, or Target near you. Folgers® Fridays Summertime Sweepstakes promotion. Every Friday through September 4th, 2015, Folgers® will be asking their fans to answer a daily question for a shot at some amazing prizes! 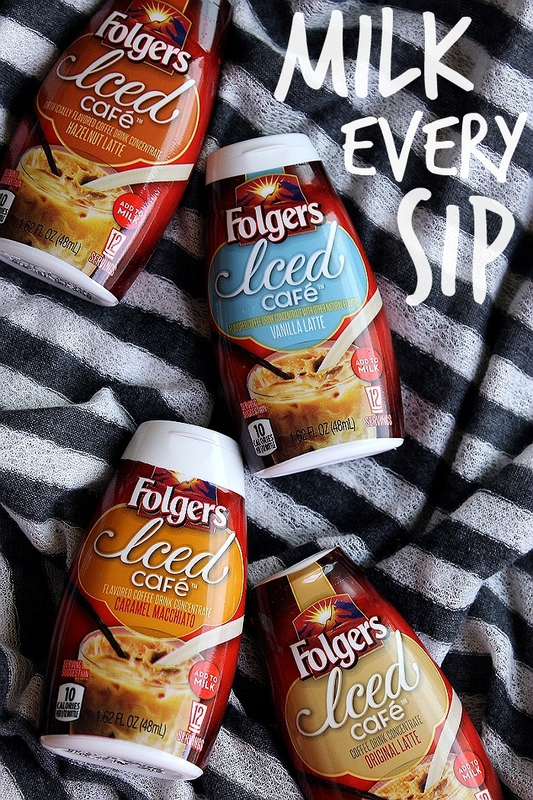 For details on the #FolgersFridays Promotion and a store locator to find Folgers Iced Café near you, please visit http://folgers.com and follow Folgers on Facebook and Twitter. Oh? This little thing? 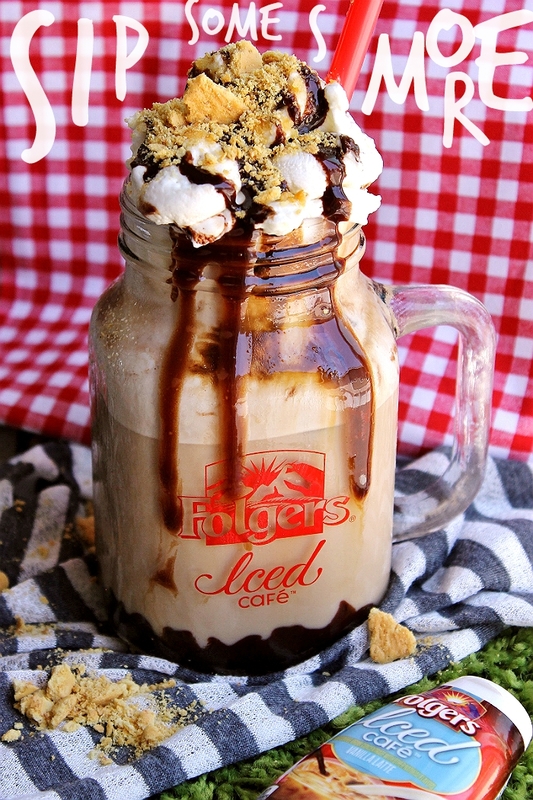 I whipped, pun intended, this up last Friday with my Folgers® Iced Cafe™ Vanilla Latte and Folgers® Iced Cafe™ Hazelnut Latte varieties, and you can too with some chocolate syrup, heavy cream, powdered sugar, and graham crackers. The secrets in the Marshmallow Whipped Cream made when you whip 1 1/2 cups of heavy cream with 3 TBS of Powdered Sugar until stiff peaks form. 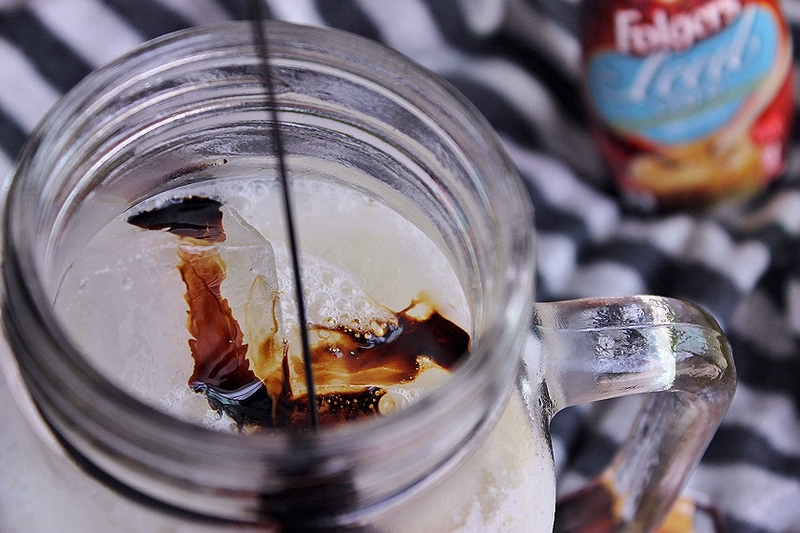 Drizzle some chocolate syrup down the sides of your Iced Cafe™ glass, pour in some ice, milk (or milk substitute), and 1 squirt of each Folgers® Iced Cafe™ flavor then give a quick stir. Plop a generous portion of Marshmallow Shipped Cream on tip, drizzle with more chocolate, and sprinkle with crushed grahams- you're welcome, America. 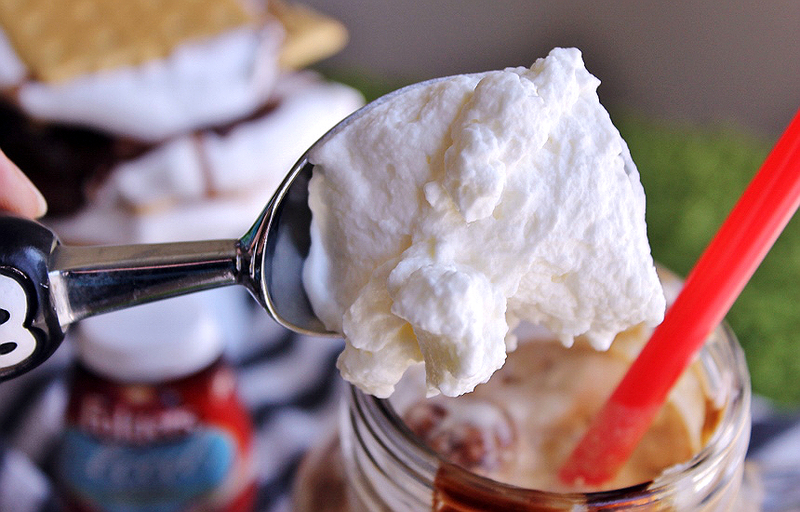 Do you have a favorite flavor or way to enjoy a cold coffee inspired beverage? 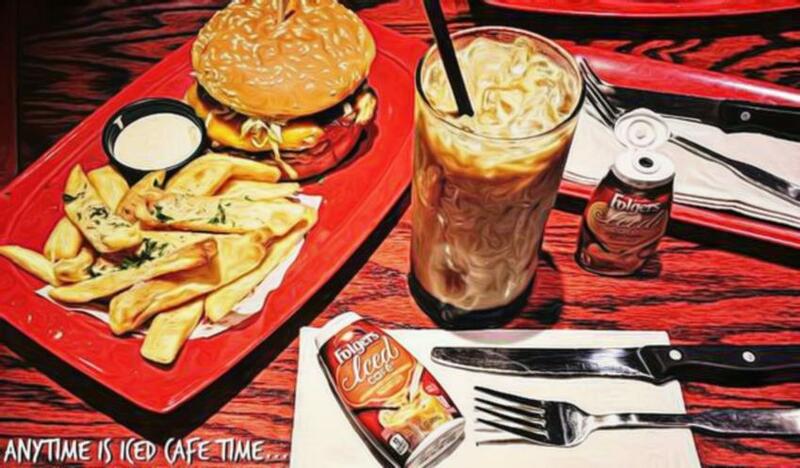 What flavor would you like to see added to the Folgers® Iced Cafe™ range next? What Daughter Says: Don't get caught as a walking zombie- Enjoy coffee inspired iced drinks anytime without the hassle or hefty price tag thanks to Folgers® Iced Cafe™. You have no idea how badly I want to jump through my computer screen and lick that glass. Holy yum! That's the coolest thing I've seen all day! I've got to get some of this. I'm addicted to iced coffee. I've got to have my iced coffee, and this is a much more affordable way to get it than Starbucks. Thanks! Man, you know how to make me drool with your pictures! They are always so awesome! I would love to try this product out soon! My mouth and tummy are telling me I need to get to this made stat! I love the flavor of hazelnut with chocolate! Man that looks delicious! I haven't heard of these yet. When I am not pregnant anymore I am gonna get these to try out, yummy! That looks so amazing. I have these as well and they do taste delicious. I'm a Vanilla gal myself and I put cream on mine too! I love anything from Folgers. I will have to try these out! That just made my mouth water. I will have to try this product out! I totally have to try these out. I like my coffee super sweet and dessert-like so these would be fun to play around with. I love making iced coffee! Perfect for the summer. Wow, How interesting. New things they come up with are always amazing. I have not tried the new Folgers® Iced Cafe. It looks so delicious i am excited to pick some up and try them. I need to find these for my Mother In Law. They would be so perfect for her to take to work! yummmyy! this looks so dang good. perfect for summer. Showing this to my husband his life he's from Starbucks cost $5 what a great savings!